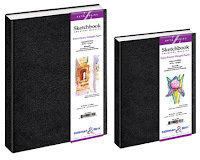 Art & Frame of Sarasota: Now In Stock - Stillman & Birn Zeta Series Sketchbooks! Now In Stock - Stillman & Birn Zeta Series Sketchbooks! We now carry Stillman & Birn Zeta Series Sketchbooks! Stillman & Birn Zeta Series Sketchbooks contain extra heavy-weight, 180lb. archival paper in either hardbound or wirebound format. The paper is natural white in shade and has a smooth surface. The sketchbooks feature enhanced wet strength ideal for multi-media artwork. The paper is sized internally and on the surface for added strength. See the chart below from Stillman & Birn to find the sketchbook that is best for you! Find Stillman & Birn Sketchbooks for purchase here!